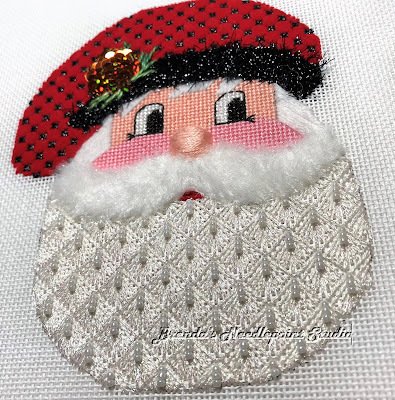 January 10, 2018--Another Janet Zickler-Casey Santa done! This is the 5th kit ordered through the Shining Needle Society and I love doing them. So much so that I have all the past ones in my "planned to stitch" pile. They are too cute. There's lots of texture to this little guy--sequined pine cone on the cap, little button nose, fluffy moustache and beaded beard. Lots of stitching variety. 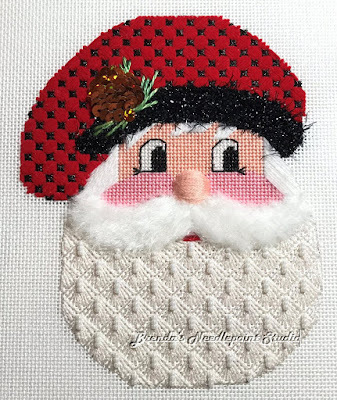 December 29, 2017--Recently signed up to take the Shining Needle Society's annual Janet Zickler-Casey santa class. This year's is called Pine Cone Santa. Two lessons have been posted to date on the project's private Yahoo Group List and I've yet to begin. Will do so once the holidays are over--lots of fun traveling with visits to friends and family. Wishing everyone a very Happy and Prosperous New Year for 2018.